We thought it may be helpful to answer some of the questions you may have about our product, which are reclaimed pavers and cobblestones, in advance. Q | Are the Pavers/Cobblestones really from streets? • The pavers/Cobblestones from Experienced Bricks have been removed from streets during reconstruction projects. They are the original paving material and were often manufactured over 100 years ago. An authenticity plaque can be purchased to document your piece of history. 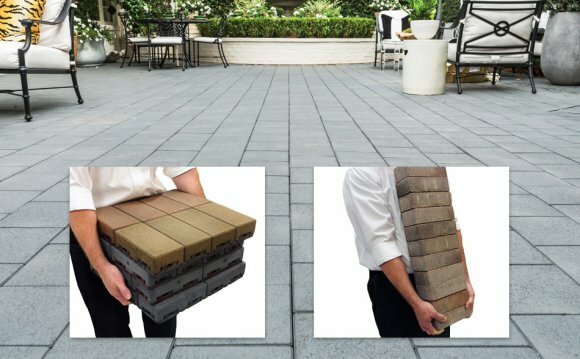 Q | Will they crumble if installed as a patio or driveway? • Every paver has been field-tested to withstand weather, salt and plowing for a minimum of 70 years! Bricks that crumble are typically building bricks that have been incorrectly used as pavers. Q | What makes a paver different from a building brick? • Building bricks are made primarily of clay and fired for about a week to create a lightweight and relatively porous finished product. Pavers are 40-60% shale mixed with clay and then fired for 2-3 weeks. The difference in mix and length of firing creates an extremely strong and durable paver. • Pavers typically weigh between 8 and 10 lbs. each while most buildings bricks weighs 3 to 5 lbs. Q | How are pavers installed? • Street Pavers are installed using the same method as installing the more common concrete paver. Polymeric sand can be used with reclaimed pavers. Q | How are the pavers delivered? • Reclaimed materials are sold and delivered by the pallet. Delivery is available or you can pick them up at one of our storage yards or distributors. Pallets weigh between 2, 500 and 3, 000 lbs. depending on the type of paver chosen. Q | How much is on a pallet? • Pallets contain between 40 and 63 square foot of paving material depending on the paver or cobblestone chosen. See the products pages for the coverage per pallet for the various types of pavers. Q | Do pavers/cobblestones need to be sealed like concrete products? • Pavers/cobblestones do not need to be sealed. The pavers were made to be weatherproof and have already stood the test of time. Q | How are pavers cut during installation? • Pavers can be cut using the same diamond blade typically employed in cutting concrete pavers. Q | Are the pavers clean and unblemished when they arrive at the project site? • The pavers have been cleaned of concrete, mortar and asphalt that would inhibit installation. They will still be somewhat dirty and may contain sand, dirt and small traces of concrete and asphalt. After installation, cleaning with a pressure washer or hose should remove any residual material from the pavers' wear surface. • Reclaimed pavers will have a certain amount of chips and cracks due to wear in the street and handling during processing. Any pavers found to be unsuitable for use are discarded during the palletizing of the pavers. Q | What if I won’t require delivery for an extended period of time? Can I be sure the pavers I selected will be available when I need them? • With a deposit, pavers/cobblestone can be reserved, Since these pavers cannot be manufactured and supplies are finite, if there is a particular product you would like to use reserving the material may be a wise move. Q | Are there spacers built into the pavers? • Each type of paver has some sort of spacer. Q | How many different types of pavers does Experienced Bricks offer? • Due to the nature of the business the number of paver types changes constantly. Not all pavers are shown on the web site. If you have a specific need, please call us to discuss availability. In some cases, we may have just a few pallets of some very unique pavers that would suit your project perfectly. Q | Can pavers be used for interior floors? • Yes! They can be used whole or we can cut off the worn face and make 1/2" thick "tiles". Q | Where can I buy these pavers/cobblestones? • Products can be purchased from a regional distributor or directly from Experienced Bricks, if there is not a distributor in your area. Q | Does Experienced Bricks also purchase bricks? • Yes, we purchase authentic brick pavers, cobblestones, curbing as well as cut stone from walls. We prefer large quantities, but will consider smaller quantities.